LOS ANGELES, Sept. 17, 2015 /PRNewswire/ -- "Like sands through the hourglass, so are the days of our lives..."
For nearly 50 years, millions of fans of NBC's longest-running drama Days of our Lives have been greeted by these timeless words. 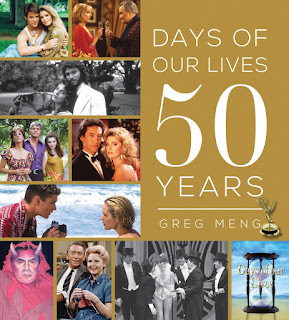 This fall, in commemoration of five decades, the daytime drama is thrilled to announce the release of the OFFICIAL and much-anticipated Days of our Lives: 50 Years by Greg Meng (ISBN: 9781492629856; OCTOBER 27, 2015; $34.99 U.S.; Television; Hardcover). The book's release is being kicked off with a multi-city book signing tour including some of daytime's most beloved faces. Cities slated for the tour include: New York, Northvale (NJ), Phoenix, Los Angeles, Denver, Kansas City, Atlanta, and Pigeon Forge. Cast participating in the nationwide tour include: Deidre Hall, Kristian Alfonso, Thaao Penghlis, Stephen Nichols, Galen Gering, Lauren Koslow, Greg Vaughan, Camila Banus, Melissa Reeves, Billy Flynn, Christopher Sean, Kate Mansi, Drake Hogestyn, Suzanne Rogers, Bryan Dattilo, Martha Madison, James Reynolds, Bill Hayes, Susan Seaforth-Hayes, James Lastovic, Peggy McCay, Arianne Zucker, Eric Martsolf, Jen Lilley, Wally Kurth, Sal Stowers, Judi Evans, as well as Author/Co-Executive Producer, Greg Meng. "As a longtime member of the Corday Productions family, it is a privilege to present this memory book. Days of our Lives: 50 Years is a collection of rare photos providing a big picture view of the show's history while reflecting the heart and soul of the show through some of the beloved and iconic stories during the first 50 years. This is a tribute to our family of fans around the world." –Greg Meng, Co-Executive Producer, Days of our Lives and Executive in Charge of Production, Corday Productions Inc.
Days of our Lives: 50 Years is an in-depth, photographic journey of the longest-running scripted program in NBC's history. This beautiful book showcases new and exciting views of a television icon that continues to bring the much loved world of Salem to its loyal viewers. Including rare black-and-white historical images and a wealth of full color photos, this is a spectacular journey highlighting iconic characters and beloved stories. Days of our Lives: 50 Years is available for pre-order NOW and will be available for purchase on Amazon.com and in book stores and Barnes & Noble locations nationwide October 27, 2015. Tantalizing Triangles – Relive the complex affairs of the heart between Bill, Laura and Mickey; Roman, Marlena and John; and Carrie, Austin and Sami. Supercouples – Fall in love with Bo and Hope, Patch and Kayla, and Jack and Jennifer all over again. Bad to the Bone – Stefano DiMera reigns at the top of a long list of villains who have brought trouble to Salem over the years. Shocking Twists – Bo is Victor's son!, the real Roman Brady returns!, Vivian buries Carly alive!, and who was revealed to be The Salem Strangler, The Salem Slasher and The Salem Stalker! Groundbreaking – The first gay male couple to be married on a soap opera (Sonny and Will-2014), the first interracial romance on a daytime soap (David and Valerie-1976), and the first soap opera stars to appear on the cover of TIME (Doug and Julie-1976) are just a few of the many "firsts" featured on the show. Follow us on twitter @NBCdays and @daysofourlives and like us on Facebook.com/DaysofourLives for updates on times, dates and locations. Days of our Lives: 50 Years is an unparalleled peek into Days of our Lives—a favorite daytime drama that has not only become an important part of American pop culture, but is also adored by millions of fans around the world!. Greg Meng, Senior Vice President of Corday Productions, is Co-Executive Producer and Executive in Charge of Production of Days of our Lives. He is also the bestselling author of Days of our Lives: Better Living and Days of our Lives 45 Years: A Celebration in Photos. Sourcebooks is creating the next evolution of a book publishing company. We are committed to innovative publishing, to exploring every platform and creating breakthrough models. We truly believe that books have the power to touch people and change lives. Sourcebooks is home to 120 enthusiastic book-loving employees who are dedicated to finding new ways to connect with authors, readers, and ideas. We publish over 300 new titles each year, and are honored to have 48 New York Times bestsellers. Sourcebooks is proud to be one of the largest woman-owned book publishers in the country. Visit www.sourcebooks.com for more information.